We also understand that you may do all the working out, exercise, running, stretching, lifting, and flexing that you can manage and still not see the results you want. For this reason, we are proud to offer Nutrition Support for all of our members. During your first visit, we will work with you to establish goals and then we’ll follow up with you to provide some nutrition options. You can choose from those what works best for you. We will never ask you to starve yourself or over-exercise, but small manageable and inexpensive changes may help you reach your goals. We have a partnership with an organic and local grocer nextdoor. They offer 25% off memberships for all Ultimate Dance Members. So while it may be a little more expensive to eat healthy than to eat fast food, our partnership with Nomad’s Market is aimed to mitigate some of this! 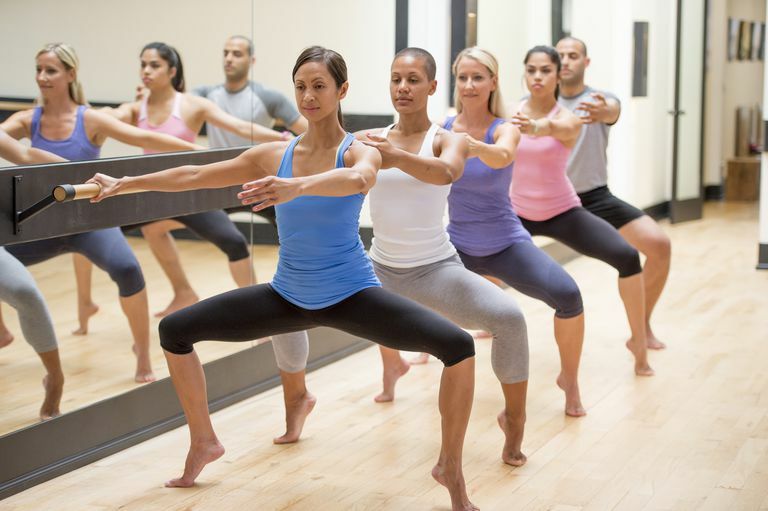 For those of you looking for a more meditative and strength-focused fitness approach, Barre is a great option. We respect that many of you like to handle cardio on your own – running, swimming, etc – but need some help with your strength training. Barre is specially designed for people like you as it is slow, steady, controlled, strength training. Barre is derived from classic ballet stretches and moves. It is designed for people who want to be strong and long as it develops strength in small muscles over time. You will use a floor mat, a ballet bar, and small handweights as I, or one of my colleagues, walks you through the stretches and exercises to get you where you want to be. You won’t leave this class too sweaty or exhausted, but you will leave feeling stronger. And you’ll definitely wake up sore the next day. And for those of you who like a small group setting for both cardio and strength training, we offer a Zumba dance class either directly before or after every Barre class. Both clocking in at 45 minutes, you can get a lot of exercise into an hour and a half! And finally, we have ZUMBA COMPETITION – our most intense, difficult, challenging Zumba Class. This class is offered at dance studios throughout the city. For this one, attendees are involved in the choreography development. It includes gymnastics, tricks, cheerleading pyramids, etc. And at the end of each year, there’s a literal Zumba Competition at the Recreation Center downtown. The winning team takes the crown for the year to follow. We are looking for six new dancers for our current Zumba Competition Team. We still have the crown from winning last year (!!!!!) and we want to bring on some new ideas and bodies to help us keep the crown next year! Specifically, we are looking for dancers with design/costuming experience and music background. Zumba Intro: The Zumba Intro class is great for people who are a little less confident with dance terms and choreography. This is more of a training for the class than a fitness class itself. In this class, we teach proper technique and positioning, terminology and how to interpret that, and the most common class structures. Taking this class first may improve your experience in the other classes so you can focus on your mental and physical health rather than memorizing moves and interpreting dance terms. Zumba Special: If you have special fitness needs, like you have a funny hip and you’re not sure how to exercise without hurting it, or you are attending physical rehabilitation after an injury and you want to supplement that with a dance fitness class, etc. Whatever the case may be, if you have special needs but still want to explore our dance fitness options, take a Zumba Special class when beginning and we’ll incorporate replacements for common moves, ideas for your own dance, and guidance as to how you can stay fit but respecting your body’s healing timeline. Zumba Gold: Zumba Gold is perfect for older folks looking to be fit. The moves are broken down more, the cardio is more manageable, and corrections/replacements are offered throughout. As we age, our capacities for movement change and we want to help you respect those changes. Zumba is a high impact fast moving dance fitness class with a driving Latin beat background. At Ultimate Dance, we offer six different Zumba classes. Zumba Fitness: This is our most fitness-centric Zumba dance class. We focus on having an elevated heart rate for as much of the class as possible and incorporate strength training exercises into our dance moves. This is great for the fitness enthusiast who is complementing strength and cardio training with a fun dance class so exciting you’ll forget you’re even exercising! Zumba Strength: Zumba Strength is for those of you who have hit your weight or cardio goal but are looking to increase your strength. We aim for an elevated heart rate with floor work breaks for ab and core work. And for much of the dance, you will be holding and moving weights.